With an upcoming hearing in Washington to evaluate the Real ID Act next week, Lee Tien articulates the standard for acceptable identity in America. Here's a hint: the Real ID Act is not part of the plan. WASHINGTON -The first hearing to discuss efforts to repeal the Real ID Act is scheduled next Wednesday at 10:00 AM. Murmurs from organizers behind the scenes conclude that PASS Act proponents only will be invited to join DHS Senate Committee hearing, January 15th. According to ACLU sources, S.1261's opponents are managing their expectations about the upcoming DHS Senate committee hearing and of the PASS Act in discussions. "It’s certainly not uncommon for opponents of legislation that a committee supports to be excluded from hearings. Though usually, they’re simply put on a second, smaller panel and are subject to much harsher questioning from members. Either way, you can usually tell how a committee feels about particular legislation by the composition and order of panels during a hearing," said Mary Bonventre. As of yesterday afternoon the ACLU has not yet received an invitation to the hearing. "The idea that the hearing is about re-evaluation of Real ID is the propaganda Akaka, Lieberman, DHS and everyone wants people to believe," says Stop Real ID Coalition advocate, Mark Lerner. "This is why Stewart Baker is being allowed to testify." Baker, employed by DHS, is rumored to be skeptical himself over the PASS Act's regulations to perform national security functions. While Real ID opponent, Center for Democracy & Technology is expected to extoll the virtues of compromise presented in the PASS Act. The PASS Act doesn't yet meet the standards of longtime electronic privacy advocate, Lee Tien of the Electronic Frontier Foundation (EFF) or of the Senate chairman's performance on the issue. "Put another way, congressional hearings are staged performances. Here it is being controlled by Lieberman, and he ruined PASS ID," says Tien, who found less fault with the legislation "before Lieberman got hold of it." WASHINGTON (AP) — The Senate voted Wednesday to require actual fencing along 700 miles of the border with Mexico rather than vehicle barriers and high-tech equipment. The plan by Sen. Jim DeMint, R-S.C., won approval by a 54-44 vote as the Senate began a second day of debate on a $42.9 billion measure to fund the Department of Homeland Security for the budget year beginning Oct. 1. DeMint said the U.S.-Mexico border "has become a battleground" as drug and weapons traffickers, along with illegal immigrants, move too freely. He said the department is spending too much on "virtual" fencing such as motion detectors. Those barriers, he said, don't work as well as a real fence designed to block people crossing the border on foot. Taragana.com/WASHINGTON - Biologists have determined that a 700-mile security wall under construction along the United States’ border with Mexico could significantly alter the movement and “connectivity” of wildlife, with the animals’ potential isolation a threat to populations of some species. 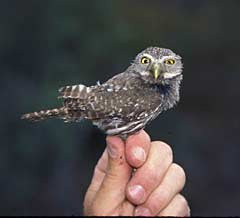 In their study, the authors looked at the potential effects of the security wall on two species - the pygmy owl and bighorn sheep. BTC Review- The Nation's Deathbed is one of the few documentaries out there about the SPP/NAU or the Secured Prosperity Partnership and how it affects someone other than the U.S. In August of 2007, riots precipitated over meetings in Montebello, Canada evading common knowledge. Media manipulation obscured the challenge to national soverignty facing the North American Continent. One stark example carried in the film, is the incorporation of propagandized vocabulary, like the word "harmonize" to directly affect trade barriers. This translates to lowering Canadian standards over many things including the use of pesticides with crops and food. While it mimics other youthful, 9-11 Truth documentaries flooding the web and grassroots media, it brings a distinct experience of Canada's open recognition of the challenges to it's sovereignty. This is identified right down to the Amero currency and a new continental identity in line with the Western Hemisphere Travel initiative. SO... What's in a census? Harmless, right? Just a knock at the door and a few questions, right? No big deal, right? Well. Then what happens to your information? Where does it land? Who has it and why do they have it? Moreover, when you find out, you'll wonder why you ever volunteered your info in the first place. You should always care how accessible you are to others to whom you have no relationship. Unless you benefit directly from the information racket, you are a resigned, apathetic, lazy, reckless, socially irresponsible slob with no identity standards and are complicit to living with no rights. You shouldn't be making decisions for the rest of us who haven't quit. 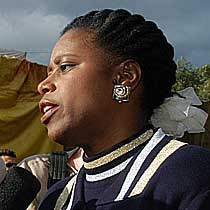 At around noon on July 5, EST, a phone call, from a verifiable source, was received by a member of former Congresswoman Cynthia McKinney's camp indicating that the American prisoners in Israel have been moved to a detainment facility closer to the Ben Gurion Airport. McKinney's imprisonment has shed additional light upon the plight of Gaza – which is one of two possible results of her trip – the other one being that supplies and a little joy for the children might have actually been delivered. 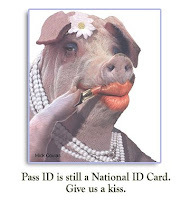 The PASS Act, S. 1261, a heavily compromised legislation which allows the majority of the Real ID Act to stay in place is moving toward a DHS Senate committee hearing in Washington, D.C.
After proving time and again that the technologies used [RFID, facial recognition biometrics, and fusion center databases] have a high failure rate in substantiating, retaining and protecting identity, we should not be required to accept inadequate standards for federalizing U.S. identity to redundance in the PASS Act or the Real ID Act. Tell your State Senators, Joe Lieberman and the Senate DHS Committee that S.1261 is not acceptable for U.S. identity and to repeal the Real ID Act in its entirety. The people of the United States are still being asked to sponsor the surveillance of their own identity in the name of immigration control and terrorism prevention . Even a casual look into the logic of mandating identity for Americans cannot guarantee an above board use of systems in the compromised identity and immigrations racketeering which sustains much of the blackmarket immigrant labor at large in the U.S. states. There are incomplete and obscured grounds to prove identity was linked to illegal immigration and terrorism based on the 9-11 Commission reccomendations. Terrorists involved in the attacks were here on legal visas granted by U.S. immigration. One visa was renewed 6 months after a hijackers suicide in the WTC towers. 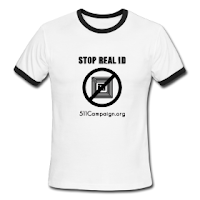 Don't allow misappropriation of your identity to lead to an inescapable surveilled lifestyle based on the U.S. current plan for identity in the PASS Act and the Real ID Act. VOTE NO on S.1261 : The PASS Act by contacting the DHS Senate committee today. Their numbers are located below. After doing so, however, he went much further and declared: "I want the introduction of identity cards for all British citizens to be voluntary." A government source said: "Number 10 knew Alan was going to make the airports announcement. But they had no idea he would simply tear up the entire policy as far as compulsory cards were concerned." Anti G-8 Demonstrations Flare Up Against U.S.
BTC- While we are expected to tighten our belts due to a bad economy, there is move to uptick U.S. intervention in Italy. It's come down to G-8. And the Italians are not happy. Pennsylvania Beating the Chip- LITERALLY! !